PAUL DU NOYER's music books and journalism cover almost 30 years of direct involvement with the music scene. He worked for the NME for seven years and was on the launch teams of Q, MOJO, heat and The Word. He has edited Q, was the Founding Editor of MOJO, and is now Associate Editor of The Word. A major strand of his work is Editorial Consultancy. Since 1989, he has worked on numerous projects with Paul McCartney, including all of Paul's tour programmes. Thanks very much to Paul for taking the time to speak to the site. Q1) The Stone Roses' debut LP has topped numerous newspaper and magazine polls in recent years. Why do you feel the album is considered to be such an important release and what is your own assessment of it ? I was in London during the late 80s, writing for Q Magazine, and had no contact with the Manchester scene. The debut has always been a favourite of mine though and I've been happy to enjoy it without analysing. At the time of its release I remember it seemed like the re-uniting of British rock music and working class dance culture, to the great benefit of both. Q2) In a career spanning thirty years, when during this period do you feel popular music journalism was at its strongest ? In a recent discussion at Liverpool Hope University (at which I attended), you alluded towards a decline in the standard of popular music journalism. When do you feel this set in ? I feel that the last ten years or so have seen a retreat from longer pieces of serious writing towards bite-sized chunks of text, Top 100 lists and so on, which are less satisfying for writers and readers, but feel like a safer option to editors and publishers. There has been a corresponding cut-back in the time that artists allocate to in-depth interviews as they try to spread themselves across the multiplying media outlets (radio, online, satellite TV, increased music coverage in non-music press, etc). The greatest days of Rolling Stone in the US saw writers accompanying acts for days or weeks on end to get a full story (see the film 'Almost Famous' for a romanticised but essentially accurate portrait of that late 60s early 70s era). Today the norm is ten minutes on the phone ! 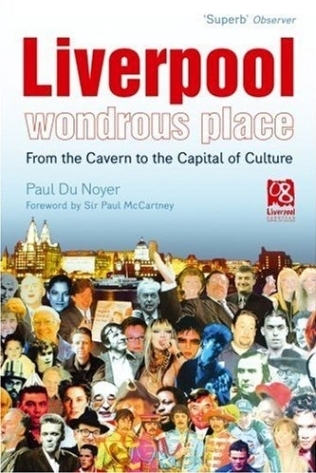 Q3) 'Liverpool: Wondrous Place' looks back at 50 years of Liverpool's popular music history, as well as the city's poets, painters, playwrights, comedians and football teams. Which events have you enjoyed to date this year in the Capital of Culture and which, in particular, are you looking forward to, in the remainder of the year ? So far I've attended the opening night at St George's Hall which I found a confusing event especially if you were away from the Plateau and had limited sight of the main stages and screens. Nobody I spoke to seemed quite sure what was going on and what it was supposed to be saying. There was perhaps too much dependence on Ringo and his new song: from a distance he was a celebrity curio and not an inspiring musical act. I saw the Liverpool Nativity on TV which looked more coherent and a great night to attend. I attended Liverpool the Musical at the Arena and found it a well-staged spectacle, very uneven musically but high on atmosphere and celebration. I could not attend the Liverpool Number 1's concert but felt the accompanying album was disastrously botched, representing neither the city's best performers nor its best songs. I would have liked to go to the John Tavener Requiem premiere at the Catholic Cathedral; I very much look forward to hearing this fascinating new piece of music. I will certainly want to see the Klimt exhibition. It will also be fun to see McCartney back in Liverpool and to experience a gig in the Anfield ground, though I don't know who else is on that bill. Left: 'Liverpool: Wondrous Place' by Paul Du Noyer. Right: 'We All Shine On' by Paul Du Noyer. Q4) Your John Lennon book, 'We All Shine On: The Stories Behind Every John Lennon Song 1970 - 1980', is a track-by-track analysis of John Lennon's last ten years. On my website, I attempt a song-by-song analysis of every Stone Roses song (and their respective solo careers). Can you tell us about your research methods for the book, and what advice would you offer someone like myself, attempting a similar kind of study ? My approach to the Lennon book was to listen closely to every track and develop my thoughts on it as fully as I could. I went back to the existing sources and read every available biography and memoir of Lennon and found every existing interview with him, then related them to the various songs where there seemed to be some connection. I also drew on many interviews and conversations I have had with Lennon's associates down the years. 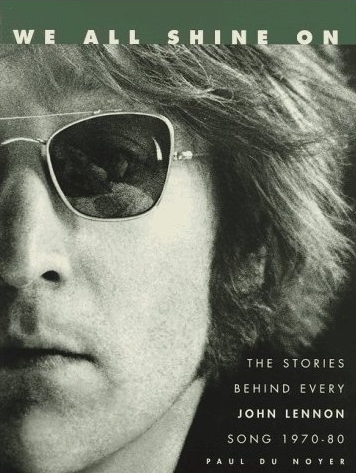 The point about Lennon's solo work is that he was often very autobiographical in the writing. I believe his songs of that period throw light upon his life, while the details of his life throw light upon the songs. I hoped a track by track study would help us to better understand the man and to enjoy the music more fully. Q5) Your greatest regret in journalism was not having the opportunity to interview John Lennon. What questions would you most liked to have asked him ? Much would depend on his age when I finally met him and his current circumstances: back in England ? still with Yoko ? reconciled with Paul, etc ? It would have been interesting to trace the development of his views on family and politics, since these were always changing during his lifetime. But I suppose that, given the fact of his death in 1980, I mostly wonder what he would make of the sanitising/sanctifying of his image since then ? He was an awkward, outspoken man and fiercely self-critical: I don't know if he would be amused or disgusted to find himself the sort of figurehead he became after death. To visit Paul's site, click here.